When I started thinking about the “family” prompt in the 52 Weeks of Gratitude Challenge, I first thought of the family that I grew up with. 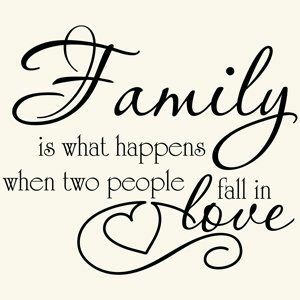 For some reason, I had never given much thought about the fact that hubby and I have formed a family of our own. Isn’t it amazing that with one choice and the two little words of “I do”, you begin a family? I am forever grateful that I met my soul mate and best friend. There is no other person in the world who loves me like he does. I’m still glad that he asked me and I chose to make him my family, all because we fell in love. Now we have our pretty little baby girl who makes us smile every single day. She’s a little bit of me and a little bit of him—the perfect blend of us both. And with her birth, we became a family of three and I can’t imagine our little family any differently. I’m grateful for this precious gift of love that has been entrusted to our keeping, all because two people fell in love. This post is in response to the 52 Weeks of Gratitude Challenge on Pinterest,”family” writing prompt. I love yall a pic!!! Yep! Having a child expands the family, it doesn't create it.